It has come to our notice that some unscrupulous agencies are alluring job aspirants with employment opportunities with Exide Industries Limited/its associate/group companies and extracting money as security deposit, documentation processing fees or training fees. At Exide, we believe in bringing in fun@work for our employees, as we feel that growth of our business is directly proportional to the growth of our people. Our aim is to help our employees graduate to the next level in learning and career development. This is achieved by our constant endeavour to introduce an array of employee engagement activities, training and community development programmes to encourage overall growth, learning and development of our employees. Come, let's explore why Exide Excites! At Exide we are a team of dreamers, movers and shakers, and entrepreneurs. We encourage our people to be the best at whatever they're doing and whoever they are. Stretch assignments, early responsibility, job rotations and great mentors are just part of what makes the real world at Exide. Ninety percent of our executive team is promoted from within isn't this proof enough? Our people deserve to be rewarded for their efforts. 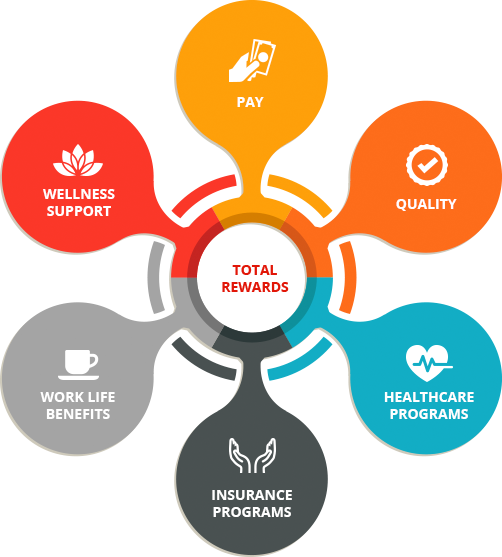 We believe in Total Rewards, including pay, quality healthcare & insurance programs, work-life benefits and wellness support. We believe in providing challenging and exciting experiences to our talent to become a generalist or a specialist based on personal interest, skills and passion. This is facilitated through a myriad of opportunities across various businesses, functions and geographies. LEAP (Leveraging Employees through Assessment of Potential): Our talent programmes identifies talent across bands with the right potential, grooming and empowering them to jumpstart their careers in key positions at Exide. Rewarding employees and recognizing their contribution at every step is an integral part of working at Exide. We have a range of Employee Rewards and Recognition programmes to keep our employees motivated and encourage them to contribute positively towards the companyâ€™s growth while also enhancing their own skills and expertise. Our reward programme 'You did it', acknowledges the outstanding efforts of individuals and teams that are aligned to the organisational value system and business goals. We have introduced a 'Jugalbandi' initiative to increase collaboration across various functions. This initiative acknowledges the spirit of joint ownership of our employees to organisational goals. Exide offers 'Exciting Growth' opportunities for interns, graduates and skilled professionals looking for career development, across our widespread network. gender, age, ability, protected status or other characteristics protected by law. 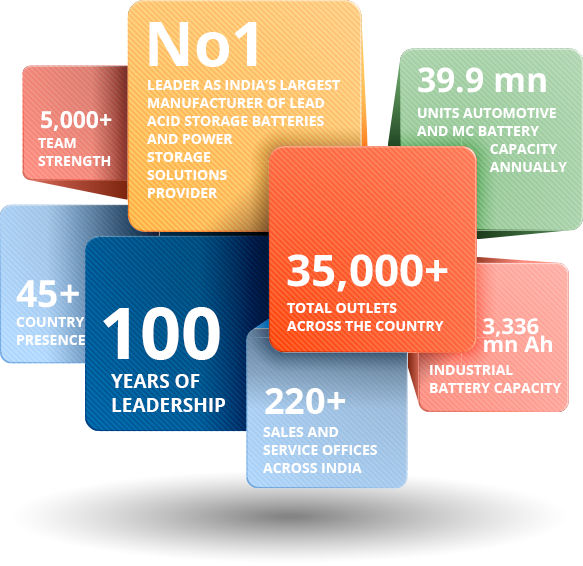 At Exide, you learn every day. Exide believes in investing in the future and our Investment is You. At Exide, we understand that business growth is directly proportional to the growth of our people, and hence we are committed towards building a talent pool which is constantly learning and evolving. Following a 70:20:10 development principle, our learning interventions are a combination of learnings gained on field, learnings driven through mentors, managers, peers and subordinates and learnings through interventions like workshops, e-learning etc. Training Matrix - Beginner, Intermediate, Advance. 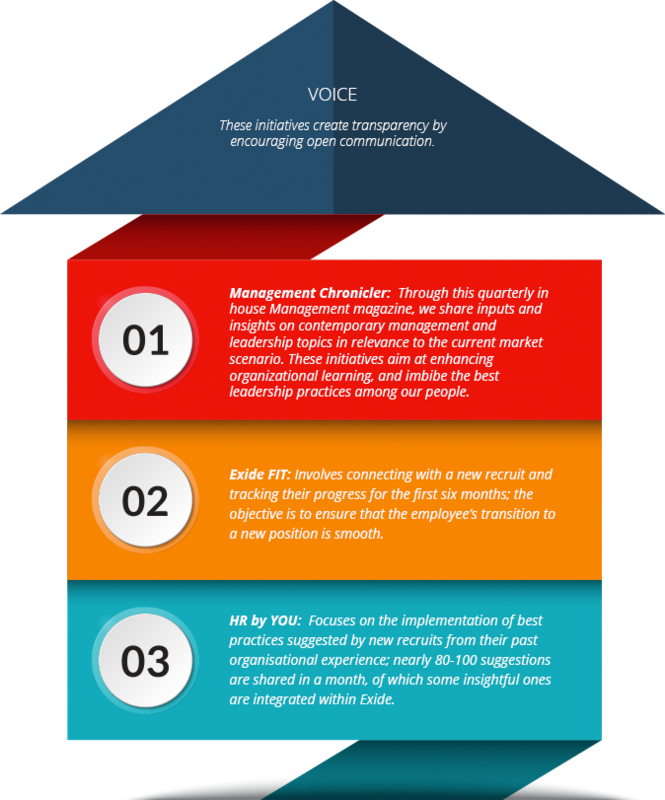 Our training matrix tracks training and skill levels within the organisation. Apart from providing a gap analysis between required and actual knowledge levels it also helps in tracking competency levels of our people to best identify the training interventions at a Beginner, Intermediate, Advance level. Our training approach is holistic in nature covering technical, behavioural as well as functional trainings. Learning AcademyIn our endeavour to build the capabilities of our employees, we have partnered with the best-in-class learning partners and institutions to develop and deliver learning interventions. Leveraging online learning mediums aids us in enhancing the learning experience by making learning available anytime, anywhere and at the convenience of our employees. We offer unrivalled opportunities to employees to help them graduate to the next level in learning and in career development. One of our key focus areas has been to identify talent and develop a leadership pipeline in the organisation. We have implemented a focused talent identification process that profiles the organisation's existing talent pool in a well-defined and scientific manner through interventions, such as leadership potential assessments. There is more than work at Exide. Our main endeavour is not only to bring in fun@work for our employees to enhance their overall development, but also bring in sustainable impacts in our neighbouring communities, both in the vicinity of our manufacturing units and society at large. 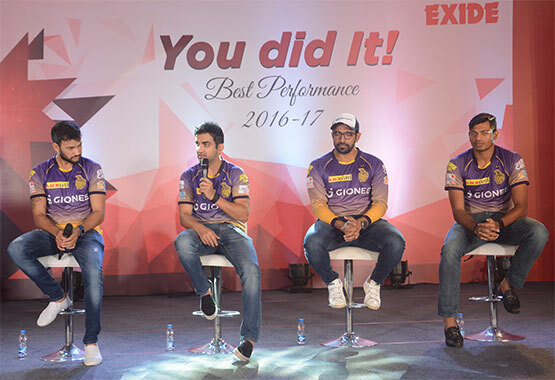 Exide Live: Our people strategy lays great emphasis on Employee Engagement. Our Annual Employee Engagement Survey 'Exide Live' is our yardstick to measure employee engagement and take corrective actions. At Exide, various communication forums are active throughout the year. Exide NEXT: Our ideation Platform where employees can directly present innovative business ideas to our CXOs. The selected ideas are then recognised and implemented across the organisation. Children and Education - We believe... Children are our future. In keeping with this thought, we have made direct interventions in school infrastructure development, education enhancement and allied projects mainly at primary and high schools. We have partnered with organizations like CINI (Child in Need Institute), India Sponsorship Committee and more, to bring in educational facilities and nutrition for children. Health and Sanitation - We believe... Good health contributes to growth. In collaboration with UNICEF we have institutionalised WASH (Water Sanitation and Hygiene) Programme in West Bengal, Assam and Bihar. In addition we have made nationalized contributions to Marrow Donor Registry (India), Diabetics Association of India. Prime Minister's National Relief Fund and Swachh Bharat Kosh, to name a few. We have also introduced sanitation facilities at plant level, including drinking water and construction of sewage drainage facilities for an entire village. We have also organized regular health check-up camps at various locations. Environment - We believe... In a pollution free environment. We aim towards bringing in environmental consciousness through our regular projects like tree plantation. There are mandatory green corridors at our plant locations. We have also invested in solar energy projects in Maharashtra and West Bengal. To ensure reduction of water scarcity we have introduced project on natural water resource management in neighbouring villages of our plants in South India. Women Empowerment - We believe... Women empower. We have livelihood and entrepreneurship enhancement programmes for women from tribal villages around our plant in Maharashtra. Our Free School Bus project is an empowerment initiative to ply girl children and young women safely to their schools from remote areas to ensure regular attendance to their schools and colleges. Employee Volunteering Programmes - We believe... In contributing towards the sustainable development of the society. Recognized by our employees and backed by our leadership team, our employee volunteering initiatives comprise of nurturing and empowering sessions to boost up the morale of the differently-abled girl child.